Ooooh goody dee har har hee, I'm loving the changes so far. 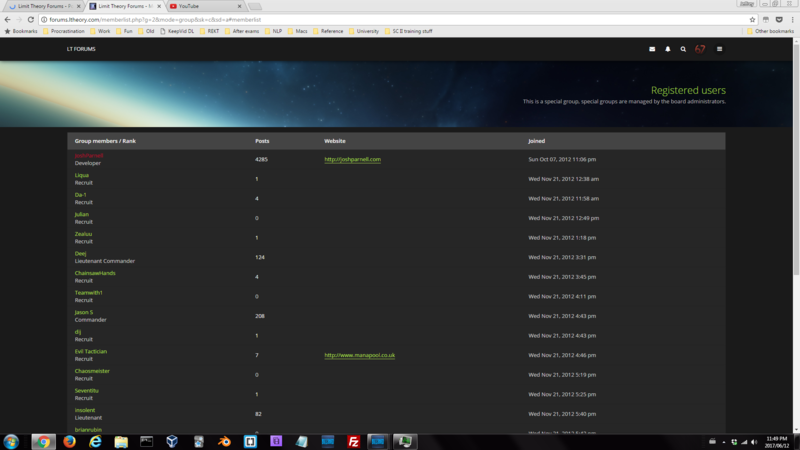 I'd say the new forums look way prettier than the old ones. Also, being notified when someone quotes me is a nice addition. P.S. Yay quotes are properly visible now! They are indeed! I like the new additions too, with the exception of the svg's. The site is broken on screens with a horizontal resolution below 1300. I rotate my monitors to vertical (so 1080x1920, rather than 1920x1080) and the HTML does not appear to compensate. I assume this will also cause issues for mobile viewing as well. Tested in Chrome, Firefox, and IE. Note... it's not that the site doesn't shrink to allow for a narrow page... that happens. It would be better if it didn't, but it's not easy to code a fully adaptive layout. The issue is that the horizontal scrollbar is disabled making it impossible to scroll to the right to see the entire page. Yeah. Make 'em go or make 'em small - they are now about 25x bigger than normal smileys. or.... make a LTFC entry only with emoji ! they would at least be useful. <-- will this be my entry for the space station edition? Stay tuned! As an addendum, I can't see an issue with the layout that requires such a high minimum width. Disabling it in the CSS does not cause rendering issue; it would probably be best to eliminate it. Note that eliminating the minimum width doesn't fix the lack of a scrollbar (which would still come up when users like me posted wide images). Not sure what's causing that. This was a temporary addition that you caught very shortly after I implemented it. It's no longer there. I'm attempting to make the site work on mobile. That actually helped tremendously... but as you said, not quite worth it for a select few PC users. It is unfortunately exceedingly difficult to make it look nice on both desktop and mobile, but I'm trying to make it work. Thanks, that was indeed a bad php error. It should now be fixed. Can you confirm? Yah, it's all good now, thanks! Random issue, but there's no indication of the sorting when you go to list the users. Not sure if this is a generic table problem, or just the user list. Thanks for the screenshot, Vector. I've spent a surprisingly large amount of the day trying to figure out what happened to image links. No luck so far. Still trying. edit: N810: The reason you're having trouble is because the font the forum uses does not work with IE, it seems. The only thing I can do to fix it is replace the font with images. Talvieno wrote: Whoa, thanks. I... don't actually know what's going on there. I'll try to figure it out ASAP. All of the forum icons are actually rendered as text using a font face whose glyphs are icons (it's called Font Awesome). So you are not seeing any because that font is failing in some way for you. Likely this is an IE + unicode issue, or else something in the style sheets causing IE to choke. It is well-known that IE does not like to play nice We will look into it. Registration is temporarily disabled. Two bots in rapid succession means more on the way. I'm going to return Taiya's banhammer.